The article describes the benefits of exercises for diabetics patients. The best and suitable exercises for diabetics patients are demonstrated with aid of videos. Diabetes is one of the most prevalent lifestyle diseases in modern world but still the awareness about the risks and benefits of exercises to patients with diabetes is limited. There are two distinct types of diabetes mellitus: lnsulin dependent (type 1) and Non insulin dependent (type 2) with distinct challenges associated with exercises. It is an inherited autoimmune disease in which antibodies are produced against the beta cells of pancreas. 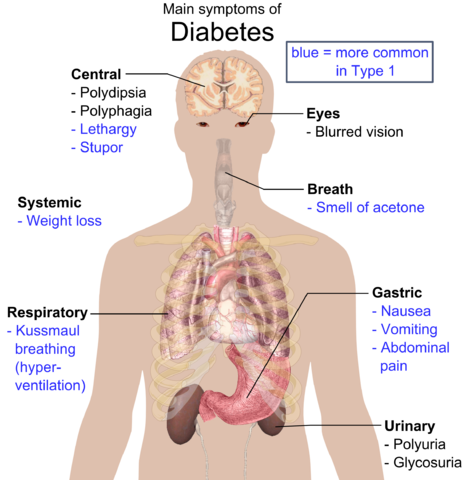 Type 1 diabetes represents approximately 10-15% of the diabetic cases. It is characterized by absence of endogenous insulin production. Therefore insulin administration is essential to prevent ketosis, coma, and death. Impairment in pancreatic beta cell insulin secretion in response to a glucose stimulus. Reduced sensitivity to the action of insulin in major organ systems such as muscle, liver and adipose tissue. Excessive hepatic glucose production in the basal state. When considering exercise prescription for a diabetic patient target should be to achieve at least 30 minutes of continuous moderate activity (e.g. brisk walking) five or six days a week provided that cardiovascular and hypertensive problems are accounted for. Blood sugar levels should be monitored before and after every workout. Supplementary glucose may be required in case of extreme heat or strong winds. Adequate amount of fluids should be consumed to prevent dehydration. Patient should be able to identify signs of hypoglycemia and should carry a source of glucose with them. Exercises for diabetics can significantly reduce the risk of developing Type 2 diabetes. In patients, exercise can help to reduce insulin requirements in two ways. It increases the body’s sensitivity to insulin and it enhances the more efficient utilization of glucose. Exercise helps lower blood sugar levels. Therefore it can help to maintain overall diabetic control. In Type 2 diabetics exercises can reverse many of the defects in metabolism of both fat and glucose. The primary benefit of exercises in type 1 diabetes comes from reduction of risk factors for cardio-vascular disease for e, g. improved blood lipid profile, decreased heart rate and blood pressure at rest, decreased body weight and improved psychological state thus increasing the life expectancy and improving the quality of life. Physical training also improves insulin sensitivity in individuals with NIDDM. Exercises for diabetics, together with a weight reducing diet will cause weight loss and reduce cardio-vascular risk and increase self esteem. Because exercises for diabetics has an insulin-like effect, exercise induced hypoglycemia is the most common problem experienced by exercising diabetics. Hypoglycemia may result when too much insulin is present, or if there is accelerated absorption of insulin from the injection site, which can occur with exercise. Accelerated absorption generally occurs when short-acting insulin is taken and when the injection site is near the active muscles. Hypoglycemia can occur during exercise or up to 4 to 6 hours following an exercise bout. IDDM individuals can reduce the risk of hypoglycemia during acute exercise by taking extra carbohydrates (e.g. glucose sweets) before, and hourly during exercise. IDDM individuals should exercise 1-2 hours after a meal. To avoid the incidence of a hypoglycemic episode it may be necessary to reduce pre-exercise insulin dosages by 30-50%, but this must be carried out under the guidance of a doctor. It is important to monitor blood sugar levels before, during and after exercise. Patients with Type II diabetes who are managed with diet therapy alone do not usually need to make any adjustments for exercise. Those patients taking oral hypoglycaemic drugs may have their doses on the days of prolonged exercises or miss them altogether depending on their glucose levels. Such patients should also carry some glucose with them and should be able to recognize the symptoms of hypoglycemia. Talk to your doctor about the right exercise for you, usually aerobic exercises are the best choice. Drink plenty of fluid before, during and after exercising. Take extra care when exercising in extreme weather conditions. Hot weather can speed up insulin absorption, while cold weather can slow down insulin absorption.